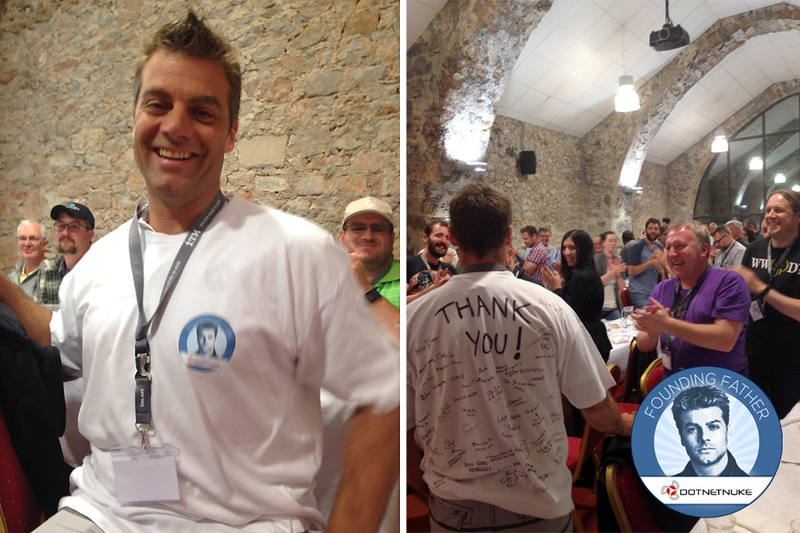 As Shaun would attend the DNN-Connect 2015 Meeting we made T-shirt and had all the attendees write their name on the back. This shirt was handed to Shaun on the last evening. Not at the conference? Add you message here! Shaun - on DNN platform 15 years now. Thanks! Hey Shaun! Thank you from Denver Colorado - We love DNN! We have been using it for a bunch of years now ... over 8 years I think. Through the powers of DNN we've sold beer kits, and lots of author's books, we've blogged on building homes, and consulted on nuclear energy, we've tried to educate on mental health issues and sold folks on the use of cloud computing, we've engineered haz waste solutions, medically pioneered office buildings, and sold commercial doors. Why we have even described the pedigrees of dogs and placed their litters into wonderful homes. While many of our customers are small to mid-sized companies, DNN has made this all very easy for them to maintain their own content once we got them all up and running. So, thank you Shawn! Your absolute hard work, commitment and willingness to share solutions made this all possible! Sincerely, Jenny J.
Shaun, I joined the DNN flight in 2004 and I have ever since remained on board. Thanks to him and to everyone that supported in one way or the other in creating DNN. It has become a way of life to me as there is no day I don't mention the word "DNN" or "DotNetNuke"
Shaun, thank you for planting a seed that has grown to become a big tree for the birds - myself inclusive - to feed on. Great thanks also to others who helped in the process. Today I am a full-time DotNetNuke developer and have done about 400 DotNetNuke projects. I became to this status because of this great DNN framework. Shoun. You are the great man and you are the founder of this excellent framework. You have done much much work for me and my family. You can be happy since you have saved a lot of lives and families. You have given so many things to the community. We are having a great life because of you. The great gentleman. I am wishing you a great future. Thank you very very much for everything that you have given us so far. Hey Shaun ! Yes, thank you, definitly !!! Because thanks to what you created I managed to convince my husband to come and live back in France with me : he took is "recently discovered" DotNetNuke with him and off we were, creating our company in Millau, around it ! So yes, I can say that you have made this possible to us, and that today, as we have done for the last 10 years nearly, we make a living out of DNN ! Wishing you all the best now and in the future, you deserve it ! Thank you Shaun. We enjoy working with DNN each and every day. It was nice joining you for the last breakfast at DNN CONNECT 2015. Although you didn't know me you reached out your hand and wished me a good trip home. So I am reaching back to you here, because sadly I didn't get to sign the shirt. It is great to still have you in community. I personally wish you all the best and hope to see you back next year. Thanks for making DNN such a big part of our lives and giving us the chance to build our income and our families on this awesome platform! YOU, are the REAL MVP! Shaun, I wish I could find just the right words to truly express my gratitude for all you have done. iBuySpy Workshop/DotNetNuke/DNN have been the technical centerpiece for several of my businesses. Without your vision and leadership, this strong community and ecosystem just simply wouldn't exist. I would not be where I am today and my businesses would not be where they are today. It seems a "thank you" is just not enough, but nonetheless I offer that to you. You have been kind, decisive and inspiring through the years and I am sure that will continue through to any new ventures. Keep in touch! Terabyte Thanks Shaun Walker. Thanks is little beside your great job. CMS with DNNreally easy and DNN is over competency. I hope you more peaks. keep working as recent steps. Shaun, It's been an amazing journey. Thank you for all of your contributions to the DNN platform and community. Open sourcing the product so early on was a pivotal decision that improved many people's lives. Your generosity, vision, perseverance and passion are legendary. Shawn, outstanding work and great leadership! You started something that has helped a lot of people, including myself, my company and many of my clients. Thank you. thanks so much for cool job. I started with DNN in 2005 as a hobby. What I know about web development I know because of DNN. During my time in the DNN community I met numerous people I now call friends. Being a part of the DNN community has been rewarding and enjoyable on several different levels. For that, Shaun, I thank you! Thank you very much for all you work Shaun Walker. Thanks IBuySpy Workshop sample I learned my C #. And Best wishes for 2015. Thank you Shaun!! I've built our company and my livelihood around the project you started, so in a way your efforts have been life changing for me, and I'm sure also for many others. Thanks Again! Thank you Shaun for your vision and for your hard work in creating this awesome community. I will always remember being at one of the Las Vegas conventions and giving you a hard line of questioning about User Interface. You were gracious and you took everything I said in consideration. :) I wish you continued success in your future endeavors. been using DNN since version 1 many thanks for a wonderful project ! Thank you Shaun With the DNN as base framework we successfully created several solutions. Best Regards. Shaun, I personally didn't meet you until just recently but I have followed your DNN journey since the beginning, and have gained a great deal of respect for you technical and entrepreneurial success! I'll say it again, a lot of us wouldn't be here if it weren't for your vision! Thanks! Shaun, I have been using DNN since inception. In fact, even before that when IBuySpy was first introduced to show a use case scenario for ASP.Net. A simple thank you cannot express the impact you have made to so many. None-the-less - Thank you! Thanks Shaun! Your passion is the foundation of my company. Without your vision, dedication and commitment, I would not have the company I have today. I value our community immensely and thank you for giving us the opportunity to have so many friends around the globe. Thanks for creating so amazing platform, I've been around some years and haven't found any that can replace it!!! Long live to DNN!! Hi Timo, Just a quick message to THANK YOU for creating this site to allow us to thank Shaun! Great idea! Gratitude! Shaun, Thanks for this wonderful cms/framework and community you have created! Without it allot of people including myself would not have been able to start and run our businesses the way they are today. No matter what sort of knowledge a community member has you are always there to help and just keep giving. An example to us all. We are all owe you! Hello Shaun, Thank you for what you started, thank you for giving simple people like me power to deliver what my customers need. Thank you for the motorcycles, I have a "Reserved for Shaun Walker" on one bike in my garage for when you visit Ireland. Just give me 48 hours notice and I will have the bike, helmet and jacket ready to go. I hope you are enjoying this new phase of your life. Shaun, thanks for the great start. Thanks to that i enjoy every day the possibilities of a stable and flexible platform. There has no question i didn't answer with DNN. I've seen a lot of people contributing to the community, a result of your start. Thanks also to the community to pickup this great platform and build forward on it! Shaun, thank you for the tears, the sweat and (almost) blood it (sometimes) took to keep this project afloat all these years. It shaped the life of many people, grateful people. Thanks for the wonderful gift you gave the world! Thank you Shaun for not only giving us DotNetNuke but for brining the ASP.NET community into the Open Source spirit. You are the person who showed me that it is ok to give code away and help others. I'm still doing it to this day! There is so much I could say here. But I'll keep it short. Thank you so very much for your efforts, along with all of the others, to start a platform that has become something great that has allowed so many to build businesses around the platform. Shaun, thanks for all this nice cars. Thanks! Thanks for firing up the .NET Nuke passion in me, thanks for laying the foundation of my professional life, thanks for making every working day a day I can practice my hobby. You will never be forgotten! My thanks to Shaun, too. He done so much for DNN and the community, We all will missing him! Thank you for DotNetNuke and the community. You have brought a lot of friends in my life. Thank you so much, Shaun... None of us would be where we are right now if it weren't for you! I have no idea what my life would be like without what you've released to the public back in 2002. DNN was my personal initiator for delving into web development and it is the backbone of my business ever since. Thank you so much. Thank you Shaun for creating a project that would change so many lives. I wouldn't be where I am today if you hadn't released IBSW back in 2002, and my family wouldn't be what it is either. Best wishes to you for 2015.